One day in the not-too-distant future, your braces will come off. Within a few minutes, you'll be free of bands and brackets, able to eat what you want, and happy to run your tongue over smooth, clean teeth. But, even on this happy occasion, please remember that you're not quite done with orthodontic treatment yet: The next phase, called retention, is just beginning. Teeth aren't set rigidly in the jawbone — instead, they're held in place by a network of fibers called the periodontal ligaments. After they have been moved, it takes several months for the periodontal ligament to adjust to the new position. So, if you want to keep that new smile — and not waste all the time, effort, and money it took to get it — it's essential to wear your retainer as directed. Being fitted for a retainer involves impressions a week or two before your braces come off. Then, we'll discuss your retainer and start getting it ready. 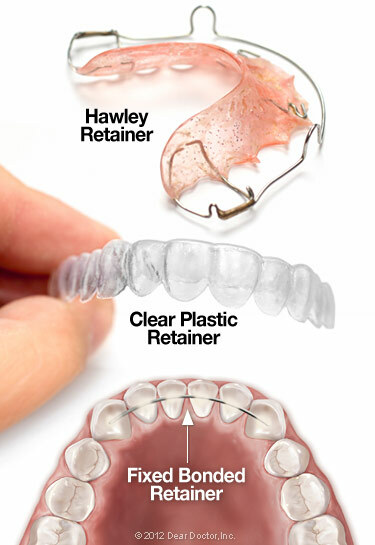 After a short time, most people adjust quite well to wearing a retainer. Some may find that they produce more saliva than usual for a day or so after first wearing any type of retainer — a normal reaction to a foreign object in the mouth. You may also find it a little harder to talk normally at first, but that problem will soon disappear. We encourage our patients to leave their retainers in their mouths while they eat, but if they take them out, put them in a case for safe keeping.